Lent is not just the season for giving something up. It’s an opportunity to lament and look inward. It’s an invitation to pause and regroup—to shake off old dust and take new steps. As a creative team, we have crafted resources to help you walk through the season of Lent with intention, reflection, and creativity. Here’s a fun compilation of ALL of our Lenten resources (plus some for Easter) over the past few years. If you are a busy pastor or church worker, we hope these materials offer you comfort and inspiration in the midst of your preparation. If you’re familiar with our work, you may know that we release new resources in bundles to make them a bit more affordable and to encourage you to try utilizing materials you may not purchase individually. Be sure to check out our 2019 Cultivating & Letting Go Lenten Bundle of resources first, as you’ll see the bundle’s individual components listed below! From poetic prayers, to full worship liturgies (with creative elements), to a sermon-planning guide, these materials offer fresh, insightful, and sometimes lyrical words for worship. These short films blend visual imagery with either spoken word poetry or scripture to offer meditative moments for reflection. Use these in worship or in a class or programming event. For Lent, we have developed the tradition of offering a Lenten coloring calendar. Ever heard of that? We hadn’t, so we decided to create one. 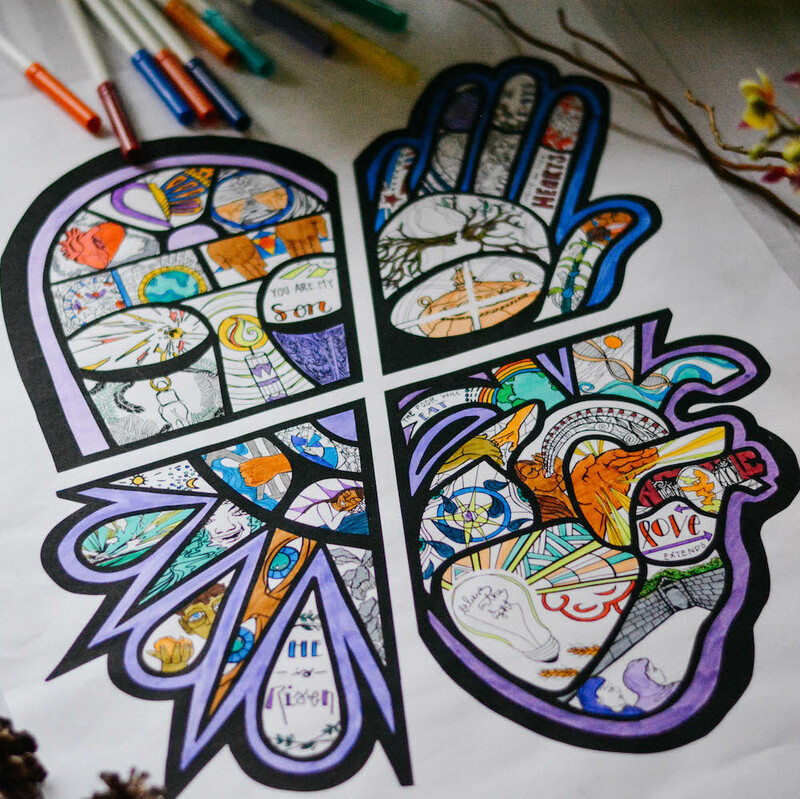 Throughout Lent, color in a shape each day (or week) with imagery inspired by scripture. By Easter, you will have filled your work of art with color. The accompanying devotional guide offers written reflections, poetry, and prompts. Print these materials for yourself or your entire church! Please note: Years B & C were produced in 2017 & 2018 and include those older dates. The Year C calendar + devo includes 2019 dates. We hope to empower you to create art with others in community to bring the themes of Lent to life in tangible form. These resources provide you with the tools to create paper lace banners, or an intergenerational art installation shaped by everyone in your church! Each year, we offer new original visual art inspired by the lectionary scriptures. Below are our Lenten visual collections, which also include artist statements and a visio divina bible study curriculum so that you can use our visuals in Sunday School or other group study contexts. Our Stations of the Cross series is a moving way to offer the Stations as an art installation. It includes a Companion Guide with scripture and written reflections for each Station. Coloring is a simple way to provide space for either intergenerational communal art-making or individual reflection. Incorporate them into your bible study, youth group, prayer stations, children’s church, fellowship events, etc. Like our visual art, we create new coloring pages each year based on the lectionary and include written reflections on the imagery. For all of our coloring posters, we provide digital files for printing them in three sizes (8.5x11, 11x17, 24x36). One of the ways we aim to serve you is by offering you tools for quality graphic design. These materials not only help you effectively communicate announcements about your worship and seasonal themes; they also offer visual icons with deep theological meaning. Below are some of the themes you might use to shape your Lenten season. Want to preview some of our Lenten materials? Join our newsletter crew & we’ll send you samples from our 2019 Lenten resources! Click below to see previews of many of our 2019 resources, which can all be found in our Cultivating & Letting Go Bundle!